Several Israeli military vehicles, including armored bulldozers, advanced into Palestinian lands across the eastern borders of the Gaza Strip, early on Monday, and bulldozed various sections in addition to installing sand hills. The soldiers also shot two Palestinians. Media sources in Gaza said the soldiers invaded lands in Khuza’a town, east of Khan Younis, in the northern part of the Gaza Strip. During the invasion, the soldiers bulldozed the lands and installed sand hills, in addition to firing live rounds at the Return Camps, wounding one Palestinians in Jabalia, in northern Gaza, and one east of Abasan al-Jadida town, east of Khan Younis, in the southern part of the coastal region. At least eight military vehicles simultaneously invaded Palestinian lands east of Jabalia, in the northern part of the Gaza Strip, and installed new barb-wire fences while army war jets, and drones flew overhead. 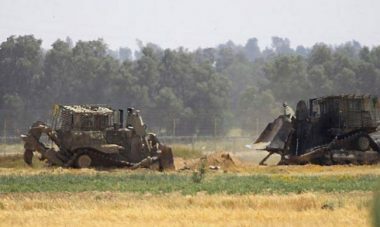 The army also invaded Palestinian lands east of Rafah, in the southern part of the Gaza Strip, and east of al-Boreij, in central Gaza, bulldozed sections close to the border fence, and installed sand hills. It is worth mentioning that the army has significantly increased its deployment, not only across the border areas in the besieged Gaza Strip, but also various parts of the occupied West Bank, especially in occupied Jerusalem. The Palestinians will be marking the Nakba Day when Israel was created in the historic land of Palestine, on May 15 1948. 1.4 million Palestinians lived in 1,300 Palestinian towns and villages all over historical Palestine. More than 800,000 of the population were driven out of their homeland to the West Bank and Gaza Strip, neighboring Arab countries, and other countries of the world.